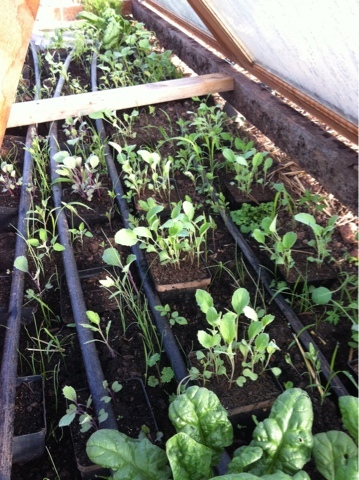 We have seedlings in lots of spots on the farm. The other night it was 30 degrees..not good news for teeny tiny sensitive seedlings. We did not lose very many, using a variety of types of protection..this one, old French doors a neighbor removed..Homer made them into a cold frame..lots of things sprouting, even tomatoes!